So back a week or so ago on our podcast where we reviewed Solo: A Star Wars Movie, my co hosts, Chad & Stew, started having a most excellent discussion about comic books based on TV shows and movies (click here if you haven’t already listened to it). 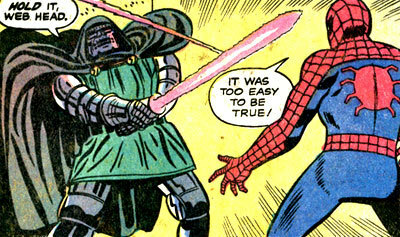 One of the topics that was brought up was the insanely great Spidey’s Super Stories comic written for kids based off Spidey’s appearances on the PBS educational show, The Electric Company. 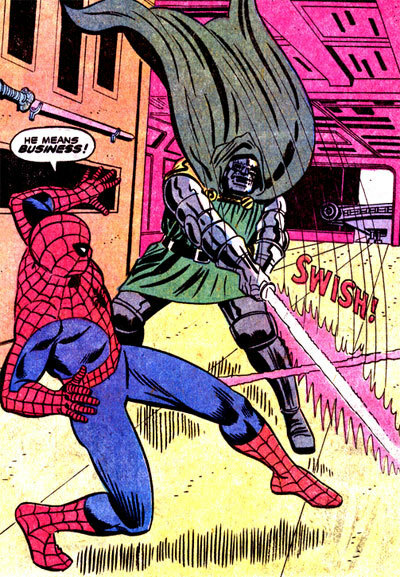 Although Chad remembered the fantastic “Thanos-copter” from one of those issues, he had not heard that there was another issue where finally, Doctor Doom muscles into Galactus’s turf by trying to eat the planet with his “Star Jaws”. 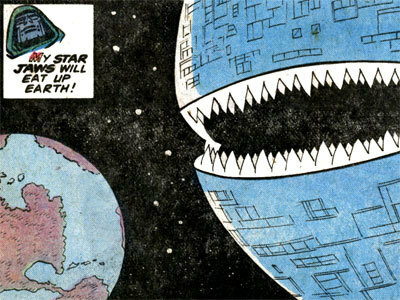 Indeed, in a definite way to cash in on Star Wars mania, Doctor Doom decides to munch an Earth sized lunch with a goofy shark faced space station. Now that I got that little piece of housekeeping out of the way, it’s time to talk about what I was really wanted to write about for this blog: The Phantom. Yes, friends, the Ghost that Walks, is one of the world’s oldest superheroes, predating such historic comic characters as Superman and Batman by several years. 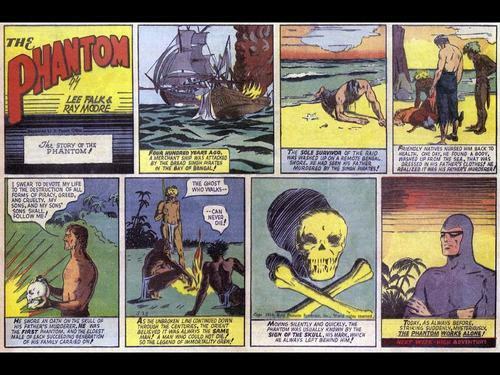 Written for decades by Lee Falk until his death in 1999 and appearing mainly as a newspaper strip, the story of a long legacy of heroes who all adopted the same identity thus promoting the idea that the Phantom could never “die” was read by as many of 100 million worldwide at the peak of his popularity. 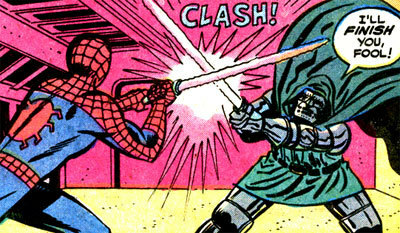 It still is written today in its strip form as well as several other related properties in traditional cover to cover comic books. Over the course of more than seventy years’ worth of stories, the back story “legend” of the Phantom grew to become an integral part of the series. The legend of the “Ghost Who Walks” made the character stand out from the innumerable costumed heroes who have battled crime throughout the 20th century, and helped maintain his appeal through to the present day. Much of the underlying, continuing plots and themes of the series focus on the continuing legend of the Phantom. The series regularly quotes the “old jungle sayings” surrounding the myth of the Phantom. Perhaps the most well-known of these is the tradition that anyone who sees the Phantom’s true face without his mask will certainly “die a terrible death”. Not all stories were set in present time, but included earlier generations. While the costumes looked the same, the weaponry varied with the age, such as revolvers and pirate flintlocks. 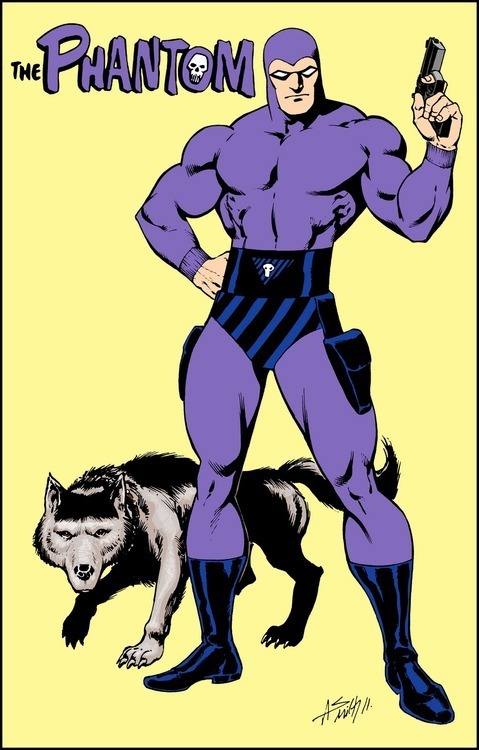 Knowing my love of comic strips like Flash Gordon, Mickey Mouse, and Popeye, it seemed that reading the Phantom strip was something I would obviously at some point get to. But for some reason, I kept putting it off, and now some 20 years after seeing that Phantom movie, I have only scratched the surface of the Phantom’s vast library of stories. But I believe that’s finally going to change. Spurred on a recent viewing of the first two episodes of the Phantom movie serial (which is also excellent I might add), I’ve decided to finally tackle some of the Phantom in my read pile reviews. I figure I’ll read these during my summer vacation to South Carolina next week and do a read pile review of them the following week. So yes, I guess the entire point of this blog was to tease/promote a future blog that I’ll be writing after I get all tan and handsome from lounging on the beach. Now the only question is whether I’ll read of the original Lee Falk comic strips as I’ve done a couple times previously, or one of the other laundry lists of authors that have written about the character over the decades.